The Barcelona celebrations will carry on long into the early Catalan hours, but it is time for us to call it a night. Make sure you join us on Wednesday for our next helping of European fun - the Coppa Italia final between Juventus and Lazio on Wednesday. Adios! Another season of failure for Real Madrid - and make no mistake that's what it is when they don't win the Primeira Division - means this: the Bernabeu club have won the Liga just once in the past seven seasons. Remarkable for a club of their size. So what does Barcelona's Liga win mean for Real Madrid? It means Italian coach Carlo Ancelotti's job is far from secure. Spanish journalist Guillem Balague reckons that Madrid president Florentino Perez has already sounded out four men to replace Ancelotti - Rafa Benitez, Jurgen Klopp, Zinedine Zidane and... Jose Mourinho. 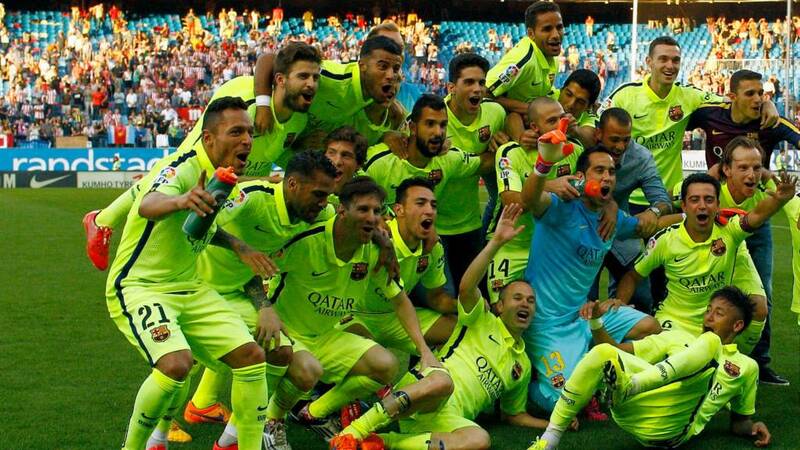 Barcelona coach Luis Enrique: "Right now I'd like to thank everyone who helped in achieving this title and our fans." Barca president Josep Maria Bartomeu: "We're very happy. First objective: achieved. Now that we've won La Liga, the next step is the Spanish Cup." according to the Guardian, are set for a £3m windfall if Barcelona defeat Juventus in the Champions League final next month as part of last summer's deal for the Belgian. Taurai Chinoruma: Thomas Vermaelen won the FA Cup without kicking a ball, and now he has won La Liga without kicking a ball as well!! Another ex-Premier League player is also enjoying the Barca celebrations - but he hasn't quite had the same impact as Luis Suarez. Injury-hit defender Thomas Vermaelen has barely had a kick since arriving from Arsenal, although that's not stopping him from guzzling the cava. Look there's Luis Suarez! The Barca striker's leg injury, which forced him to sit out today's title-clinching match, does not seem to be hurting too much as he jumps up and down in celebration with his team-mates. Chelsea Warrior: And we all said Barca were in crisis previously. What crisis? Former Barcelona striker Gary Lineker: "Barcelona, 2015 Liga champions. Congratulations. #ViscaElBarca." Luis Enrique's impact at Barcelona has not been met with universal love, but the coach has taken the first step to a remarkable treble in his debut campaign as the Nou Camp boss. Former Barcelona captain Carles Puyol: "Congratulations, champions!!!! You're the best. Visca el Barça!" Champagne moment? Perhaps that should be Cava moment. A few bottles of the sparkling Spanish wine, produced in the Catalonia region of which Barcelona is the capital, have been smuggled on to the pitch as the Barca players spray bubbly over each other. Luis Enrique breaks into a huge grin as he leaps from the Calderon bench to hug his coaching staff. The rest of the bench tear on to the pitch as the luminous-yellow shirted Barca players jump about in pure delirium. All over in the Calderon as the referee blows his final whistle. Barcelona are the Spanish champions! Madrid kept their part of the bargain but it was not enough. They needed a favour from city rivals Atletico but it did not arrive. Another great save - this time at the other end. Atletico keeper Jan Oblak needs to be alert to palm out Lionel Messi's free-kick which appeared to be destined for the bottom right corner. Cristiano Ronaldo heads home at the back post after James Rodriguez's cross - his 45th league goal of the season and his seventh hat-trick in La Liga this term. Well, we think this was a great save. Claudio Bravo jumps into action to tip over a fierce shot from Atletico's Jose Maria Gimenez. That almost gatecrashed Barca's party. Barcelona are still attacking as they look to bag the second goal which would sew up the title. Lionel Messi jinks this way and that, before being crowded out by the home defence. Jeremy Mathieu slices wide a cross from the left touchline when the ball breaks out to him. The Vicente Calderon rises in unison to salute two of the all-time Spanish greats. Barcelona skipper Andres Iniesta, who scored Spain's winning goal in the 2010 World Cup final, is given a standing ovation as he is replaced by club captain Xavi. Barcelona are 10 minutes away from winning La Liga. Any away victory today will see off Real Madrid's challenge - but an Atletico equaliser would take the title race to the final weekend. All credit to Madrid, who are doing their bit to keep their title hopes alive. Javier Hernandez does brilliantly to hook the ball back to Cristiano Ronaldo and he arrives to drive home his second of the match. Almost a third for Barca. Pedro sends a vicious shot whistling past the Atletico upright. Atletico, as you would expect from a Diego Simeone side, are not giving up. Diego Godin is hustled out of possession by Ivan Rakitic, who has the legs on the Uruguyan defender to nick back possession and clear inside the Barca box. Somebody is whispering in the ear of Barca coach Luis Enrique. "Boss, you've won your first Liga title as a manager," will be the jist of it. Oh dear. It's all going wrong for Madrid. A terrible touch from goalkeeper Keylor Navas allows Cristhian Stuani to close him down. The scuffed clearance falls to Sergio Garcia and he sets up Stuani to score. Madrid now need a minor miracle to prevent Barcelona being crowned champions tonight. I'm not sure how many Barca fans have made the trip to the Spanish capital today - but they are certainly in fine voice. And so they should be as their team are 20 minutes away from becoming Spanish champions again. Barca should be celebrating a second goal as Ivan Rakitic and Lionel Messi combine to tee up Neymar. But the Brazil forward loses composures, leans back and skies over the Atletico crossbar. News of Lionel Messi's goal for Barca has filtered through to most people in the Power8 Stadium and it's fair to say neither set of supporters have welcomed it. The atmosphere is decidedly flat, all of a sudden. The Barcelona bench restores their clam after erupting to celebrate Lionel Messi's opening goal. Luis Enrique allowed himself a brief roar of delight, before regaining composure. He barks out some orders as his team look to see out the final quarter of the match. Barcelona are 25 minutes away from winning La Liga! And who else but Lionel Messi scores the opening goal. The Argentine superstar plays a quick one-two with Pedro, takes a couple of neat touches, then forces low across Atletico keeper Jan Oblak into the bottom corner. Karim Benzema set up Cristiano Ronaldo's goal but it's his last involvement of the evening. The Frenchman limps off and is replaced by Javier Hernandez in attack. Cristiano Ronaldo makes it 43 league goals for the season, driving the ball low under Kiko Casilla. It means that, as it stands, the title race will go to the last day, with Madrid moving to within two points of leaders Barca. Anyone know the Spanish for "squeaky bum time"? Charlie Meach: Luis Suarez has proved such a crucial signing. Without him neither Neymar or Messi have the space to work. Facilitator. Madrid are turning up the heat now. Karim Benzema hits the post with a volley from Marcelo's left-wing cross but it would not have counted anyway because the flag was up. Then Cristiano Ronaldo smashes a free kick high over the bar. Did you know, he's scored just one direct free-kick this season? End to end stuff at the Vicente Calderon. Atletico break quickly on the counter as Fernando Torres races on to a precise throughball. The Spain striker holds off the attentions of former Liverpool team-mate Javier Mascherano to shoot low towards the Barca goal, but away keeper Claudio Bravo is perfectly positioned to gather. Back to the day job for Diego Godin. The Atletico defender is needed in his own penalty area to stick his forehead on a dangerous high ball. Big chance for Atletico! Diego Godin is one of the most potent goalscoring defenders in Europe - but he misses the target on this occasion. The big Urugayan escapes his marker to meet Koke's right-wing corner, only to power a rising header over the Barca goal. Most would put a small fortune on the Atleti centre-back to score in that situation. As you know we're back underway at the snappily named Power8 Stadium and hosts Espanyol have gone close in the first minute of the second half. Sergio Garcia shows good strength to hold of Madrid defender Daniel Carvajal but his shot curls narrowly wide of Keylor Navas's left-hand post. Barca go straight on to the front foot, winning a left-wing corner almost instantly. Atleti partially clear the set-piece, only as far as centre-back Gerard Pique who sees his shot blocked by the body of a home defender. Barcelona: Bravo, Alves, Pique, Mascherano, Jordi Alba, Busquets, Iniesta, Rakitic, Pedro, Messi, Neymar. The referee over in the city of Barcelona, where Espanyol host second-placed Real Madrid, also restarts proceedings. De Gea heading back to Spain? A bit of news to bring you from the English Premier League, where Manchester United manager Louis van Gaal has been discussing the future of David de Gea, a reported Real Madrid target. Asked if he could reassure United fans that De Gea would stay, Van Gaal said: "No, I cannot. But a transfer is a process, involving a player, a club and his present club. He has to choose. It's not easy to choose between two great clubs. He's Spanish and his girlfriend is Spanish, so we would be very happy if he stays." Will he stay? "You never know." As well as the action involving the two title hopefuls, there is plenty going on in the Spanish top-flight. All of the penultimate weekend's fixtures have kicked off at the same time. Good news for Atletico as Valencia - their rivals for the final Champions League spot - are losing at home to Celta Vigo. At the bottom, relegation-threatened Deportivo are in the process of hauling themselves out of the bottom three as they lead 1-0 against Levante. Other than a couple of early saves from their keeper Claudio Bravo, Barcelona have dominated this contest. Lionel Messi has missed a couple of golden chances (yes, you have read that right), had two penalty shouts turned down, while Atleti keeper Jan Oblak has needed to be sharp on a couple of occasions. No goals so far and very few chances. Cristiano Ronaldo has had the best opportunity, heading wide at the far post. Other than that, Carlo Ancelotti's crafty cigarette has been the highlight. No goals at the Vicente Calderon. But no goals between Espanyol and Real Madrid either. And that means - as things stand - Barcelona will be crowned Spanish champions in about an hour. Barca right-back Dani Alves is well known for his marauding runs, not so for his long-range shooting ability. Here, the Brazilian combines both elements, sending an ambitious 25-yard shot dipping towards the Atletico goal. Home keeper Jan Oblak has to be alert to tip over. Espanyol might be Barcelona's neighbours but they are showing no signs of rolling over to help Real Madrid's cause. Anaitz Arbilla sends an optimistic drive over from about 30 yards, while Felipe Caicedo (remember him, Manchester City fans?) is proving a nuisance to the visitors' defence. Still Barca probe for a breakthrough ahead of half-time. Jet-heeled Barca forward Pedro tears to the right bye-line to pull back towards Lionel Messi, only for some desperate Atletico defending to stop the Argentine teeing up Jordi Alba. Actually I might have done a disservice to referee Alberto Undiano. He might well have actually booked Atletico defender Diego Godin, not the fouled Dani Alves earlier (see 18:31). That would make much more sense. We'll try to clear that one up at the break. Barcelona are doing most of the attacking at the moment, albeit very patiently as they try to unlock a typically-organised home side. Pedro tries a spectacular bicycle kick - he scored one last weekend - but cannot connect cleanly. As things stand Barcelona will win the title tonight. That's because they are matching rivals Real Madrid's result. Cristiano Ronaldo swaps passes with Isco to get in behind the Espanyol defence but the Portugal star is about five yards offside. Ancelotti has swapped the exec box for the posh seats in the stand and has ditched the cigarette in favour of biting nails. And Lionel Messi clips the top of the Atletico crossbar with the resulting set-piece. Close, but not close enough. Half an hour gone in the Spanish top-flight - and still no goals in our two main matches in Madrid and Espanyol. Oooh, hang on - is this a penalty in the Vicente Calderon? Barca right-back Dani Alves goes down in the Atletico box. The referee blows his whistle. And he points for a free-kick outside the box for a shirt tug on Alves. Sebastian Ampofo: Madrid's slide after the winter break has been alarming and may well cost Ancelotti his job. Still this game whizzes from end to end at a frightening speed. Not sure how long it will last though - temperature at pitchside is 88 degrees apparently. Scorchio! Carlo Ancelotti is having to watch his Real Madrid team from an executive box as he serves the first of a two-match touchline ban. The Italian is caught by TV cameras having a sneaky cigarette as he watches the action. A stress-busting fag perhaps? Ancelotti's suspension means English coach Paul Clement - his assistant - is Los Blancos' main man in the dugout today. Not sure what he'll have made of the visitors' start. They've had the best chance but Espanyol are giving them plenty to think about. Nope, still not Messi's day. Yet. The Barca talisman clips the free-kick into the Atletico box, but it is a little too strong as home keeper Jan Oblak jumps up above a cluster of bodies to easily gather. It is a rather muted appeal from Barcelona for a penalty - but an appeal nonetheless. Lionel Messi meets a deep right-wing cross with a diving header, but sees his goalbound effort blocked by Atleti centre-back Diego Godin. Messi reckons the Uruguayan uses his hand. Not a penalty for me. Barcelona have settled down again after needing goalkeeper Claudio Bravo to come to the rescue in the opening 10 minutes. The away side burst forward on the counter attack through Messi, Pedro and Neymar, before the ball is returned to Messi on the edge of the Atletico area. The Argentine pulls the trigger - but fires well over the bar. John McEnerney: Atletico haven't hit the heights of 2014, didn't replace well enough. But Simeone will have them pumped up for Barca, tricky enough for Messi and co.
Big chance for Real to draw first blood but, almost unbelievably, Ronaldo misses with a header at the back post after Daniel Carvajal's superb cross in from the right. You'd have put your holiday home on the Portuguese forward scoring there. Messi AND Ronaldo both missing simple chances within seconds of each other?! We kid you not. Ladies and gentlemen - we have a proper game on our hands in Madrid. High tempo, hard tackling and plenty of chances. Lovely. Two chances fall into the path of Barcelona's Lionel Messi in the space of a few seconds - but the Argentine cannot convert either. Scarcely believable I know. First his low shot is straight down the throat of Atleti keeper Jan Oblak, before Messi plants a free header straight at the Czech. Over in Barcelona, second-placed Real on top in the early stages without really threatening. Gareth Bale latched on to a Karim Benzema through-ball but was flagged offside and Cristiano Ronaldo has seen a shot blocked after receiving Bale's pass. Claudio Bravo is keeping Barca in this at the moment! The Chilean keeper reacts instinctively again to beat away Antoine Griezmann's fierce half-volley from an acute angle - following another dangerous home corner. Atletico are going for Barca's jugular now. Atletico are extremely strong from set pieces - and that is where they could hurt Barca. Following that free-kick for the foul on Torres, the home side win a couple of consecutive corners. The second is flicked goalwards by Jose Maria Gimenez, forcing Barca keeper Claudio Bravo into an acrobatic claw away from his net. Fernando Torres (remember him?) starts up front for Atletico today in place of Croatia striker Mario Mandzukic. And the ex-Chelsea and Liverpool man drops deep to collect the ball on the halfway line as Atletico look to mount their first attack. Torres is dumped to the turf, in the shade of the Calderon main stand, to win a free-kick. Whistles rain down from the Atletico stands as Barca go backwards in their bid to maintain possession. Not that the Blaugrana will be fussed. Atletico barely had a kick yet. In the bright sunshine which covers half of the Vicente Calderon pitch, it is Barcelona who are enjoying plenty of possession in the early stages. The Catalans are hogging the ball, but yet to pick a hole in the Atletico backline. The referees at Atletico and Espanyol, plus the rest of the Spanish top-flight, synchronise their watches and blow their whistles for the first time. Barca are 90 minutes away from winning the Spanish title. Espanyol: Casilla, Arbilla, Gonzalez, Colotto, Moreno, Alvarez, J Lopez, Abraham, Sanchez, S Garcia, Caicedo. Substitutes: Pau Lopez, Felipe, Salva Sevilla, Stuani, Canas, Fuentes and Montanes. A warm embrace between the two respective coaches - Diego Simeone and Luis Enrique - as their captains contest the toss. Almost ready in Barcelona too - where the 'other' team Espanyol host Real Madrid. Atletico won the Primera Division title in the Nou Camp last season - but Barca have no feelings of revenge. "Atletico were just champions and had a great season. It was unique and now this season is totally different," said Luis Enrique. "We are not looking for revenge and for us the opportunity to win the title is enough of an incentive." Little under 10 minutes to go until the penultimate round of La Liga matches kick off. Time for you to grab a quick cuppa before settling down to focus on our coverage. Feel free to shout up with any thoughts you have ahead of the game - will Barca win La Liga tonight, do they deserve to, has Luis Enrique got the credit he deserves, etc. The floor is yours. Use #bbceurofooty on Twitter or text 81111.
of a row between coach Luis Enrique and talisman Lionel Messi. The Catalan club has also faced a series of off-field issues, including having an appeal against a transfer ban rejected in December and the sacking of sporting director Andoni Zubizarreta in January. "You have to go through tough times and this team is bombproof," added Spain international Gerard Pique. Life is going swimmingly for Barcelona at the moment. The Catalan club will regain the title with a win at Atletico Madrid today, just four days after reaching their first Champions League final since 2011. Throw a Copa del Rey final - against Athletic Bilbao on 30 May - into the mix and a tasty treble is on the menu. "To have the chance to win the treble at this point in the season doesn't happen often," said Barca centre-back Gerard Pique. "There is not much to go, but it is the most difficult part and we have to stay united." Of course, we almost had to find something else to do with our Sundays instead of following the climax of the Spanish season. Painting that tired-looking fence in the back yard perhaps, or trudging around a furniture store looking for that new sofa. Thankfully there is no need to put yourself through such pain. would be plunged into chaos after the Spanish Football Federation (RFEF) moved to suspend the end of the season, with the backing of the players' union - including Barcelona's Xavi, Atletico's Juanfran and Real's Iker Casillas. Real Madrid make two changes from the team that drew 1-1 with Juventus on Wednesday. Long-serving goalkeeper Iker Casillas and injured defender Sergio Ramos make way, with Keylor Navas and Pepe coming in. Real Madrid XI: Navas, Carvajal, Varane, Pepe, Marcelo, Kroos, Isco, Rodriguez, Bale, Benzema, Ronaldo. To be fair, Real Madrid coach Ancelotti hasn't had a lot to smile about recently. His team's defeat aggregate defeat in the Champions League semi-finals means they are in serious trouble of ending the season without a trophy. If Barcelona beat Atletico Madrid today - or better Real's result - then that will be that. Espanyol, on the other hand, need a win to keep alive their hopes of playing Europa League football next season. Sergio Gonzalez's team start the day in nine spot but only a point behind Malaga in seventh. Seventh place could be enough to get into Europe - if Barcelona beat Athletic Bilbao in the Copa Del Rey. If Barcelona are going to win the title today then they will do it without Luis Suarez. The Uruguayan forward, who has scored 14 goals in his last 15 Liga matches, was substituted in the midweek Champions League semi-final at Bayern Munich because of a hamstring injury. Barca XI: Bravo, Alves, Pique, Mascherano, Jordi Alba, Busquets, Iniesta, Rakitic, Pedro, Messi, Neymar. Hola amigos! Football has a strange habit of throwing up quirks - and that, my friends, is why we love it. Exactly 12 months ago, Barca were humbled in their own backyard by Atletico and forced to reluctantly hand over the Spanish crown to Diego Simeone's side. Today, Atletico could be officially deposed after a one-season-only reign - with Barcelona ready to reclaim the throne. The Blaugrana's ascension will be completed with a victory, although a draw may be enough if second-placed Real Madrid are beaten at Barcelona's city rivals Espanyol. So Real are relying on Atletico, and Barca could be helped by Espanyol. What were we saying about quirks? 17 May 2014. Barcelona v Atletico Madrid. Nou Camp. Atletico needed a draw to be crowned Spanish champions for the first time since 1996. Atletico earned a 1-1 draw and the acclaim of almost 100,000 Barca supporters inside the Nou Camp. 17 May 2015. Atletico Madrid v Barcelona. Vicente Calderon. Barcelona need a win to be certain of regaining the La Liga title from Atletico. But will they be crowned champions at Real Madrid's expense in the Spanish capital today? And, if they are, will 50,000-plus Atletico fans graciously congratulate their successors?